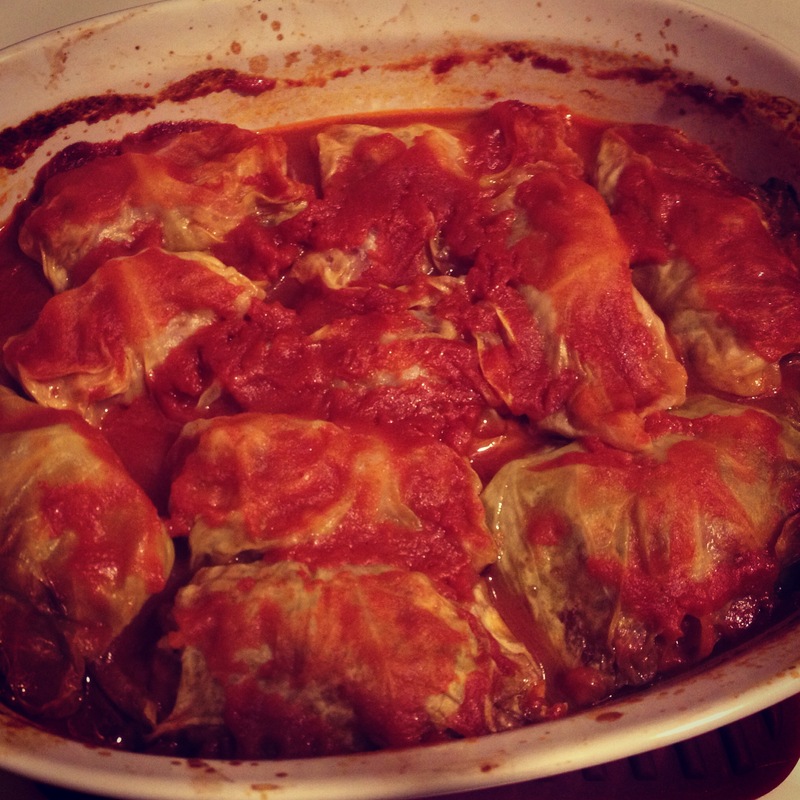 These stuffed cabbage rolls are my great grandmother’s recipe passed down from my mom but I’ve made a couple adjustments. They are a little labor intensive, however, what I love about them is you can alter the recipe to make them semi sweet or semi savory. I love trying to find the perfect balance, sometimes I toss in some spice. I usually increase the vinegar and substitute whole grain mustard for yellow. In a large mixing bowl, combine the ground beef, pork, cooked rice, egg, parsley, garlic, salt, black pepper, nutmeg, and Worcestershire sauce. Mix very well with your hands, or a wooden spoon, until completely combined. Cover and refrigerate until needed. Bring a large pot of water to a boil. My mom taught me to steam the cabbage but I found that a quick boil is so much easier. Carefully lower the head of cabbage into the water. As the cabbage simmers, the leaves will start to loosen and can be pulled off with a pair of tongs. As each cabbage leaf comes loose, remove them one by one from the simmering water, and into a bowl of cold water. Transfer to a layer of paper towels. Alternate 3-4 cabbage leaves with 3-4 paper towels to soak up all the moisture. They will cool while you are working on the meat and the sauce. You’ll need about 16-20 large leaves. Reserve the rest of the cabbage to fill in layers. When the cabbage leaves are ready, divide the beef and rice mixture into logs. Place the meat at the bottom of the cabbage leaf (where the stem is the thickest) and roll up, folding in the sides as you roll. The rice will expand, so don’t roll too tightly. In saucepan, stir together apple juice, butter, vinegar, Worcestershire, sugars, tomato sauce, mustard and cool. In a covered dish, cover the bottom with some of the cooled red sauce and any leftover cabbage leaves. Place in 6-10 of the cabbage rolls and 1/2 of the hot tomato mixture. Top this layer and the last 6 rolls, and the rest of the tomato mixture. Cover with any remaining leftover cabbage leaves. If needed, add water or chicken broth so that the cabbage rolls are covered by about an inch of liquid. Cover and bake in a 350 degree F. oven for 1 hour 15 minutes. Remove from the oven, and use a fork to test one of the rolls to see if the rice is cooked. If it needs more time, add more water, cover, and cook for another 15-20 minutes, or until the rice is tender. When done, remove, and let rest covered for 30 minutes before serving.